Add a rejuvenating foot scrub to the basic reflexology session. Rejuvenate your feet with our exclusive Sole Therapy foot treatment followed with reflexology. A blend of magnesium sulfate crystals will encourage the release of toxins through sweat glands in the bottom of your feet. In addition this calming foot soak will also soften, smooth and hydrate the feet ending with a foot massage. Customized to your individual skin type, each facial will address your main concerns and current skin condition using professional products lines including Bioelements and Physiodermie. Designed to maintain a healthy complexion leaving the skin smooth and refreshed. An anti-aging facial that addresses the common signs of aging on the face, neck and décolleté. Your skin will also be renewed with a highly concentrated serum of antioxidants, collagen enhancers and peptides. Experience instant comfort from sensitive or rosacea prone skin. This soothing, decongesting treatment will gently diffuse redness and inflammation while reinforcing your fragile capillaries. The use of natural and normalizing ingredients will improve breakouts, calm inflammation, and refine skin texture. Total rejuvenation in half the time. This treatment includes a cleanse, exfoliation, steam and a moisturizing facial massage. Glycolic Acid will lighten pigmentation, even skin tone and decrease fine lines. Optimum results will be achieved with a series of treatments. Can be an addition to any facial. Clears congested areas on the skin using a professional extraction tool. A gentle enzyme peel will dissolve dead skin cells and brighten the eye area, and a multi-task eye mask will revitalize the delicate eye tissue. Finish the facial with protective eye cream. An advanced procedure that exfoliates while infusing a topical solution leaving your skin feeling smooth and radiant. With a series of treatments the Silk Peel will effectively treat the common signs of aging, improve clarity and even out your skin tone. Enhances the basic silk peel by rejuvenating your skin with a customized facial serum, followed by a moisturizing facial massage. A hair removal method that effectively removes large amounts of hair quickly. 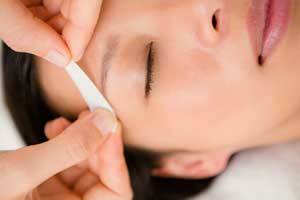 Waxing lightens new growth, will leave your skin feeling smooth and enhance your appearance. Visit our Mineral Makeup page to learn more! Melt your stress and body aches away with Sole Therapy’s Signature Relaxation Massage. 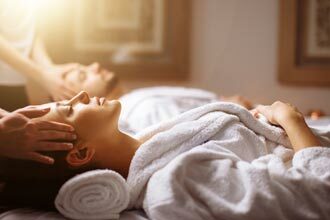 We incorporate a custom blended citrus fruit oil, steam towels on the face and back, eye pack, and a heated neck wrap to enhance the experience and promote healing from within. This exclusive experience ends with aroma breathing leaving your entire body feeling renewed. A Therapeutic massage will help relieve pain, reduce stress and work on a specific problem. The therapist will use a combination of massage modalities based on your body needs. A classic massage to help restore balance and health that incorporates a specific combination of techniques. A nurturing massage that will help the expecting mother to reduce stress and relieve aches and pains associated with pregnancy. Experience relaxation with a family member or friend while receiving a massage in the same room, by two different therapists. Relax in a private room while both of you enjoy an aromatherapy foot soak and foot scrub followed by an hour massage. A selection of fruits, nuts, chocolate, and sparkling cider or hot tea make this an unforgettable shared experience. Hot stones are massaged into the muscles to help relax tightness and are also placed on different areas of the body throughout the entire service. Adding hot stones to a massage is intended to relax tight muscles and can be an addition to any massage. Choose one or all of our custom service pairings to incorporate into your massage to help you feel more relaxed and rejuvenated at the end. 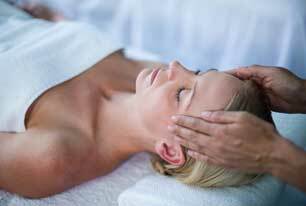 Special focus on the neck, shoulders, face and scalp to decrease pain and discomfort brought on by migraines or tension headaches. This experience incorporates a hot towel head and face compress along with a peppermint and lavender aromatherapy infusion to relax and bring about a feeling of wellbeing. Start your massage with a bamboo infused foot scrub to cleanse, smooth and revive worn out feet. An add on treatment that will exfoliate the skin on your back with an aromatherapy sugar scrub leaving it smooth and refreshed. Promote healthy skin tone, hydration and firmness beginning with an invigorating dry brush exfoliation followed by an application of therapeutic citrus fruit oil. You’ll emerge feeling refreshed and renewed with the completion of warm steam towels. 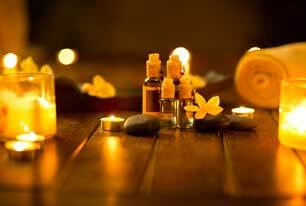 An application of healing citrus fruit oils will promote deep relaxation and soft, silky skin. Especially beneficial for congested pores and dry skin. Beginning with a cleanse and exfoliation, this treatment is completed with a purifying moisture application, leaving skin healthy and refreshed. Our hand treatments are recommended as an add-on to any Facial to enhance your service. Warm paraffin wax will coat your hands leaving them soft, smooth and hydrated. This luxurious addition to any facial or massage also relaxes the muscles and reduces pain in the joints. The Cutera Laser can effectively diminish spider veins and significantly reduce hair growth with a series of treatments to achieve smoother skin. This type of laser hair removal works best on dark or coarse hair. A noticeable amount of hair reduction can be noticed with each service. Please contact us to schedule a consultation prior to any scheduled service. Our laser hair removal treatment consultation fee is $25, collected at the time of booking. This entire fee will be applied toward a package of 3 or 6 treatments, if purchased at the time of consultation..
*Upper leg does not include bikini area. Vein Therapy and Reduction - Fade unsightly spider veins on the lower extremities to achieve a more even skin tone. 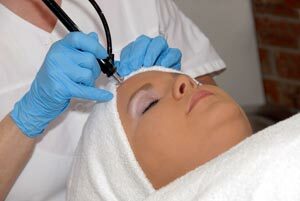 Laser Genesis is used for treatment of wrinkles, large pores, skin texture and redness. $325 for face and neck. Can be treated by Laser at Cascade Foot and Ankle (just next door to Sole Therapy), visit www.cascadefootandankle.com for more information. 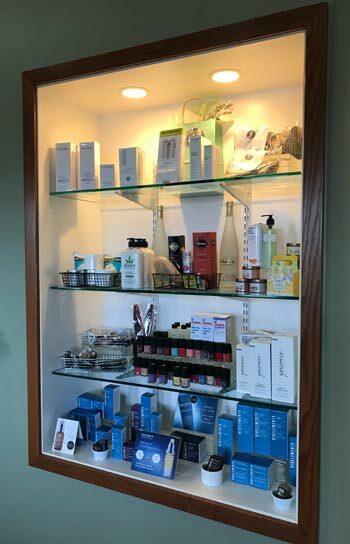 Guests can purchase products from Physioderme , Bioelements, Dr.'s Remedy Enriched Nail Polish, Epionce, Fake Bake, Gehwol, RevitaLash Cosmetics, Avojuice, Clarity MD Acne Solution, and Sole Therapy Mineral Makeup at Sole Therapy Medical Day Spa in Yakima.